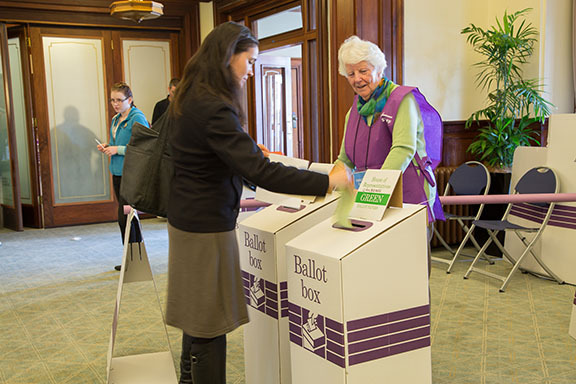 Casting a vote at Old Parliament House, 2016. Photo: AEC. We finally have a date for the Federal election: Canberrans and the rest of the nation will be munching their democracy sausages on May 18. As RiotACT and Region Media grow rapidly as a local news masthead, it’s a good time to address how we’ll deal with the forthcoming election campaign. Our focus will always be on this region: we are a local news outlet, written by and for local people and about local issues. Our focus will be on how the election affects our community rather than national news stories. For the last few months, we’ve been developing policies to provide balanced editorial content that give an equal opportunity to candidates based on their news value. That doesn’t mean you’ll always agree with our decisions. It does mean that we’re seriously committed to providing high quality, fair coverage. A note about balance: this does not mean that all candidates will be given equal time and space across the board. This would essentially be unfair, given that the majority of voters will choose from a few major candidates. We’ll endeavour to give minor candidates a run on the basis of interest but our view is that there’s more value for our readers in learning as much as possible about the candidates who are most likely to represent the ACT in Federal Parliament. Each week, Region editorial staff will tally the amount of coverage given to candidates on the site. We’re also keeping a record of all the approaches we’ve made to political candidates. That enables us to be transparent about who’s been approached, how many times, and whether they are willing to engage with us. For example, we first made requests to Labor, an independent, the Greens and the Liberal Party to interview their lead Senate candidates about a month ago. We decided some time ago that we wouldn’t accept contributed pieces from candidates until the election campaign had formally commenced. Those can now be submitted, but in common with all other submitted content, Region reserves the right to schedule these as we see fit, to edit the submissions and to decide against publication. Here are the contributor guidelines. Along with other local commercial media outlets, Region will accept political advertising at our discretion. Please contact Region to discuss home page buyouts. We won’t be running banner advertising and there will be no paid political content. If you’d like to advertise, you can find out how to do that here. We want to be part of the Canberra conversation about this election and we welcome your contributions via the website and our social media. Please note, though, that our usual rigorous moderation standards apply. Please see our FAQ and Terms and Conditions for more information. While we will be giving the campaign its due attention, our usual coverage of issues and people in the region will continue undiminished. And finally, if you’ve got a query or complaint please email us editor@region.com.au.